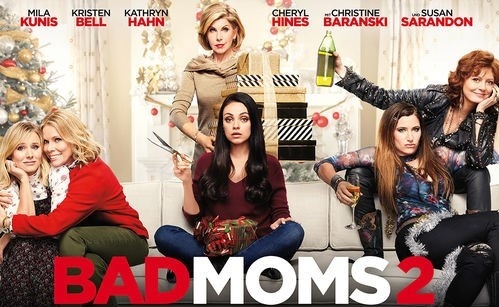 If you’re a mom, you might have already seen the movie, “Bad Moms 2” where our favorite off tilt mommies are at in again with their shenanigans. It’s definitely a decent sequel to the first which continues the storyline to include their mothers on the train wreck to parenthood. Yes, the film is pretty funny but being a previous florist and decorator, I couldn’t help not to notice the beautiful staging used to create Christmas displays within the homes. Throughout the flick, there is a constant battle between mother and daughter to solve the question of who does it better when sprucing up for a Christmas holiday-the root of the plot’s conflict. While one depends on a traditional look of a simple lights, homemade cookies and a stolen tree from Foot Locker, the style is vehemently opposed by dear mom who prefers to kick things way up into an affluent ordeal. Think crystal, matching wrapping paper, blue tinsel and a musical display of “Twelve Days of Christmas”. Yep-this one was a little over the top for even me but it was really interesting how the set designers contrasted the two different styles while keeping them both stunning for visual appeal. Which Bad Mom are you? Take a look at the trends to see which yuletide decorating fashion suits you! You’re probably low key in nature and like to reuse ornaments from previous years over and over again to memorialize past Christmas’s ago. Red, green and white are your go-to colors for palette and multi- hued lights with the big bulbs are favorites to load onto the tree and outside the home. Other designer preferences that you adore are homemade crafts from the kids, fresh pine roping to hang in every corner of each room, newspaper for wrapping and cut-out white snowflakes you also cut out on your own. You’re in this holiday season to make a big bang and to let every neighbor out there know- you own this holiday thing! There’s no way you’ll rely on the same ho-hum trinkets you’ve used in previous years because whatever is the hot trend seen in Times Square is what you’ll be replicating for family and friends. Silver, gold and blue turn you on since red and white have been done to death and there will be no strings of tinsel that will make your tree appear unkept. You’ll also like roping made of faux material because those needles will make a mess when they drop and untidy the presentation you’ve worked so hard to propel. Clear crystal glassware will be a necessity for dining as well as for lighting which will be strung in perfect ringlets across tree(s) and living space. White bulbs are all you’ll tolerate to keep things looking crisp and immaculate so don’t even think about flashing rainbow lights! Truth be told, both of these styles are really beautiful but when put together, the result will be even more gorgeous than expected. Compromise by allowing some homemade personal touches accompanied with fashionable baubles that modernize the look. Remember, the holidays are meant to be spent with family and friends so don’t waste every moment trying to perfect decorations that will only be taken down in the end.